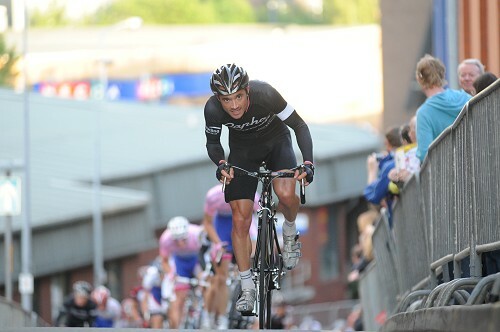 After rain threatened to soak Rochdale on Wednesday evening as the Go-Ride event was about to get under way, the night of racing in the Lancashire town centre turned out just fine with the sun shining on the circuit that Rapha Condor rider Chris Newton has made his own over the last three years. This year was no different as he won his third straight Elite Circuit Race there but it was close… really close as the photo shows. From the word go, the rider aiming to represent Britain in the Beijing Olympics and currently training for that event at Manchester, was on super form and from the word go was attacking the race and made several race winning moves but it was out of the ashes of a break that the winning move eventuated when he and Russell Downing got away from the rest. Simon Richardson of Plowman Craven did cross to them but paid for the effort and slipped back shortly afterwards. The duo opened a gap quickly and it soon became apparent that with two major teams represented by the leaders, that the rest were resigned to chasing third place despite a strong chase from Plowman Caven and Science in Sport. The third place however went to Rapha's Kristian House who clipped off the front late in the race and held his place all the way to the finish. Chris Newton: For the third time, Chris has won this race and almost being a local living in Oldham which is not far from Rochdale, he certainly had his fan club there too. Chris is the current World Track Cup Points champion, an event not to dissimilar to a circuit race with lots of sprints and efforts during the 40 kilometres on the track. A break that looked like it was going to succeed also had Chris Newton in it along with birthday boy Malcolm Elliott. Sadly for Malcolm, it was brought back after half distance. On the sprint: “No disrespect to Russell but I was desperate to get the win because it does wonders for your morale and as a GB rider trying to get to the Olympics, that’s important. To get some payback for the effort I am putting in”. 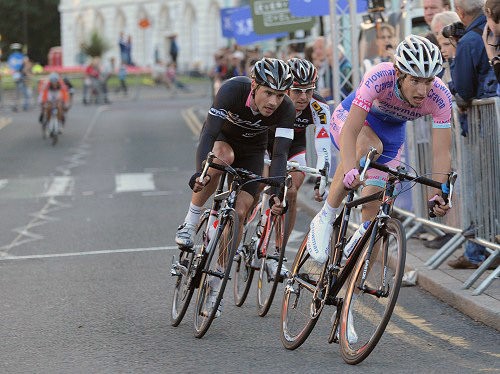 Russell Downing: “That was pretty close although I haven’t seen the pictures. 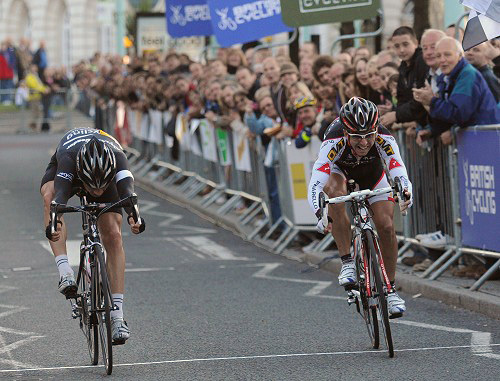 I attacked on the last lap and thought I had the gap over the top but Chris came back and he got me on the line. I’d gone from the bottom of the hill and done a full last lap at the front. Chris has been training hard for this sort of stuff (pre-Olympics preparation) so he had the legs”. 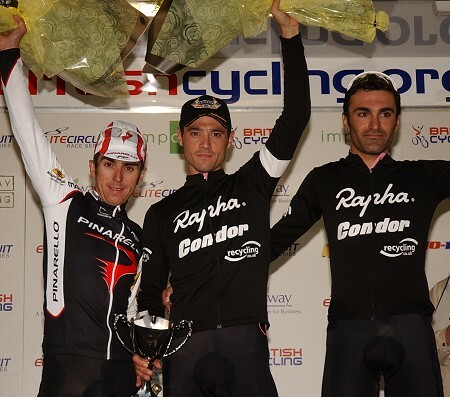 Kristian House: Third in the race was another Rapha Condor/Recycling rider making it a 1-3 for the team. At the start, the men in black had four riders on the grid before any other team had a rider called to the line which shows how well they have been doing in this series. For House, a rider very comfortable sitting in the paceline at the highest level, Rochdale was one of the few times his effort in the race was rewarded. 2. 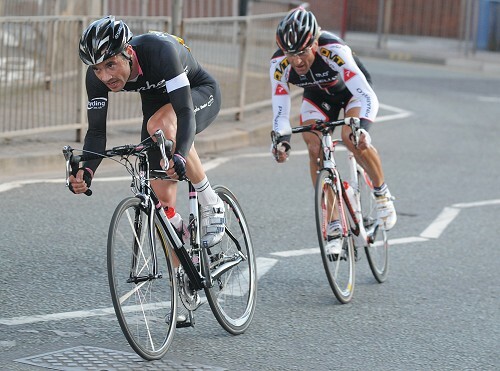 Russ Downing Pinarello R.T.
9. Malcolm Elliott Pinarello R.T.
12. Tom Murray Pinarello R.T.
14. Tom Barras Plowman Craven R.T.
16. Richard Hepworth Wakefield C.C. 21. Peter Williams Pinarello R.T.
23. Simon Gaywood Plowman Craven R.T.
24. Simon Richardson Plowman Craven R.T.
26. James Millard Plowman Craven R.T.